Picture Framing Blog - A Good Frame of Mind: Taking Your Art on the Road! Taking Your Art on the Road! Acrylic/Plexi-glass cleaning cloths — These 3M cloths lift dust, fingerprints and skin oils off plexi-glass so you can let everybody pick up your prized work for a closer look. Acrylic/Plexi-glass cleaner & polish — Show your work at its best. This polish removes static, reduces fingerprints, repels dust and improves shine. Acrylic/Plexi-glass scratch remover kit —Includes 2 oz. of cleaner, fine scratch remover, heavy scratch remover and cleaning cloth. Corrugated Corner Protectors— Protects frame corners during moves and storage. Adjustable to two thicknesses: ¾”" and 1 3/8”. Minimum order of 4 corners. Polypropylene resealable bags — Re-sealable, 4 mil bags protect unframed art while offering a clear view. Pkg. of 100 available in 5” x 7”, 8” x 10”, 11” x 14”, 16” x 20” , and 20” x 24”. TIP: Never use glass cleaners or paper towels on acrylic/plexi-glass. They will scratch and cloud the surface. Shop all of our Framing Tools & Supplies. 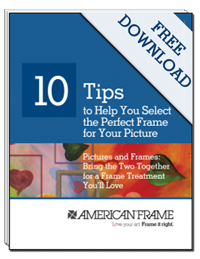 For additional tips & hints, watch our Framing Videos.